Savoury watermelon is my obsession right now! We’re having one of the hottest summers ever here in Ontario, and the only way I’ve been able to avoid wicked dehydration headaches is by drinking a ton of water (duh), and eating as much watermelon as possible. Did you know that Watermelon is 92% water? This makes it an excellent hydrator. It’s also an excellent source citrulline, an important amino acid. Apparently, this makes watermelon a great choice for post-work recovery. Walking in this heat sure feels like a workout, so I’m eating all of the watermelon that I can get my hands on. 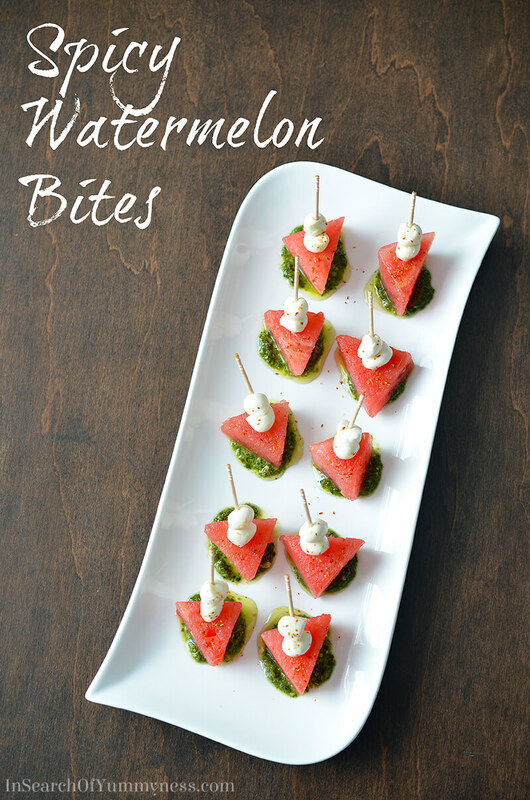 Plain watermelon is always a tasty option, but I like to play around with savoury flavours too! I’ve been sprinkling on pinches of salt and splashing Balsamic vinegar on top of cut up chunks. Sometimes I get adventurous and sprinkle on my mom’s homemade chilli flakes, which are about a thousand times hotter than what you can buy at the store. I felt like I needed a step-up from my chilli-salt-Balsamic combo after a while, so I started playing around with different vinegars, peppers and sauces. 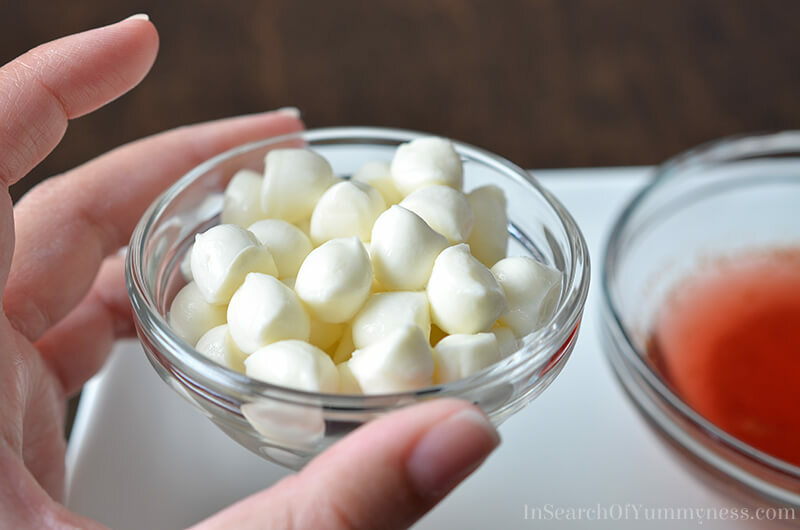 That’s how I came up with my Spicy Marinated Watermelon Bites! By the way, if you’re looking for more watermelon recipes, be sure to check out Watermelon.org. You’ll find all kinds of recipes there, including watermelon jerky, pickles and salad! Ok, before I talk about the recipe, I want to share some tips on how to pick a perfectly ripe watermelon since you’ll need one to make the bites. Look at it. You want to look for a firm, symmetrical watermelon that is free from bruises, cuts or dents. Pick it up. The watermelon should be heavy for its size! Since watermelon is 92% water; most of the weight is water. Ok, let’s talk about the recipe. The key to making these Spicy Marinated Watermelon Bites is the strong vinegar-based marinade. It’s pungent, so you might not want to taste a big spoonful when you’re putting this recipe together! I also don’t recommend leaving the watermelon to marinate overnight. I tried that, and the result was inedible. The watermelon takes on too much of the vinegar and cayenne, making it extremely sour and way too hot. Don’t do it! 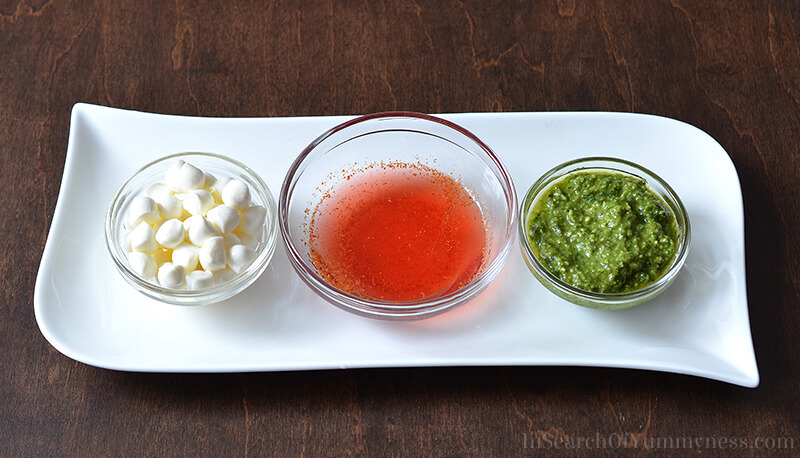 Aside from the marinade, the only other components are tiny bocconcini pearls, and fresh garlic-basil pesto. Of course you can use the store-bought stuff if you want to, but it’s hard to beat the flavour of fresh homemade pesto. Not all pesto has garlic in it, apparently, and I’m not sure that this will be as yummy without the garlic… but then I really love garlic, so maybe you’d be fine. The bocconcini pearls are actually just tiny balls of fresh mozzarella cheese. I found these in the deli section of my grocery (sold in a tub), but if you can’t find them you can always just use small pieces of fresh mozzarella cheese. This flavour combination might seem a little weird at first, but it’s actually delicious! Watermelon can often be used in place of tomatoes, so think of this as a type of Caprese salad, just with watermelon and pesto instead of tomato and basil. 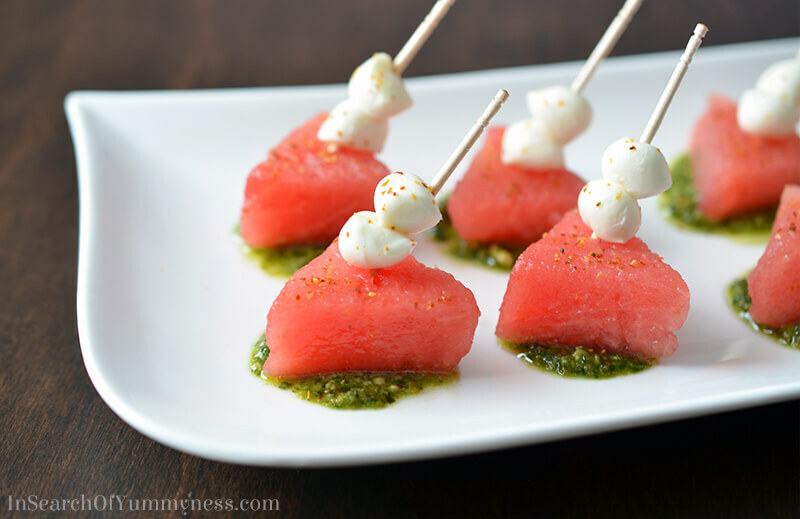 These refreshing appetizers are perfect for a backyard barbecue or summer party! Add all ingredients to a small bowl, and whisk to combine. Set aside. Cut the rind off of the watermelon and discard. Carefully cut the watermelon flesh into small triangles, about 1/2 inch in thickness. Place the watermelon pieces into a large, non-metallic bowl. Pour the marinade over the watermelon and stir gently to combine. Let sit for about 20 - 30 minutes, stirring occasionally. 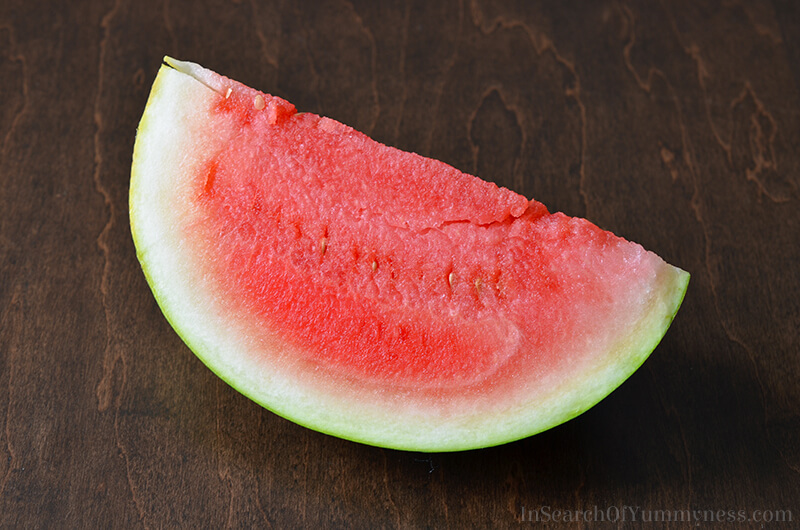 Once the watermelon is marinated, you can begin to assemble the bites. 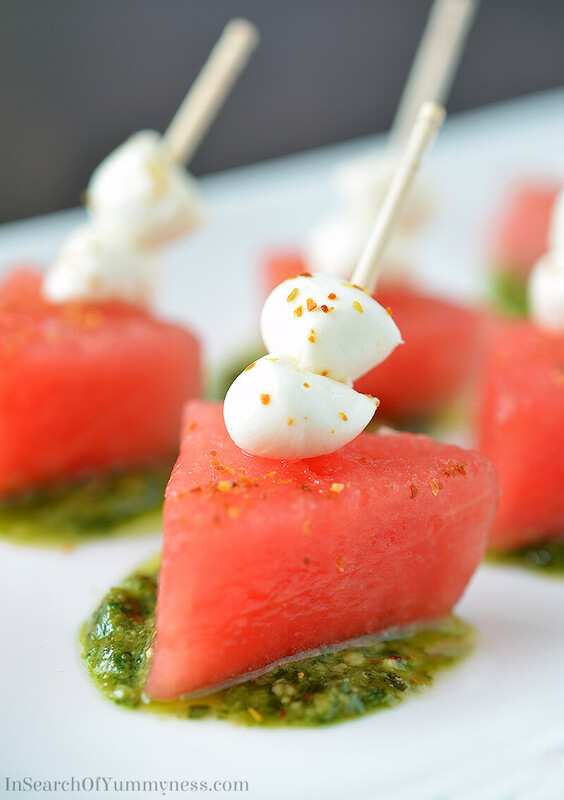 Skewer two bocconcini pearls on to a toothpick, then add a piece of marinated watermelon. Place on a teaspoon of pesto, and sprinkle with extra cayenne pepper, if desired. - Don't worry if it doesn't look like enough marinade at first, the watermelon will release water as it marinates and everything will be evenly coated in the end. The recipe and all images in this blog post belong to me. The watermelon facts were provided for me. I just love this post. Seriously! All the information in a fun way. Add to the fact that you’ve already done all the experimenting makes this a home run for me. I personally enjoy making a watermelon vinaigrette using white balsamic. It is fantastic with shrimp, feta – all the usually suspects and makes my glass of wine sing. Your flavor combos sound so perfect, I’ll be sure to give them a try. Don’t you find this weather, although, stinking hot, great for menu planning? I don’t think I’ve cooked since June – ha,ha. My kind of summer. Sounds delicious – would be nice for entertaining guests! I agree! Great for days like today where it’s 42 degrees out and too hot to eat much! This is really a lovey recipe! Never had savory watermelon but I am so willing to try! Here in Edmonton what I will remember about this summer is the amount of rain, not very hot here (at least for my liking), but watermelon is always a treat! Thanks! I hope you do try the recipe! I wish we’d get some rain here, it’s been a very hot and dry summer!! Oh, this sounds lovely. Any time there is spice added to a dish I’m in! I knew these would turn out looking delicious 🙂 I’ve never tried marinating watermelon before…looks so interesting! I was picking out another watermelon the other day and chatting up the grocery guy about it and he had a few more (new to me) tips that he shared. I have yet to cut that one open but it’s always a fun surprise to see how I did with the selection. Thanks Sofia! I think you had more faith in these than I did!! Ha! What tips did he share? Now I’m curious!